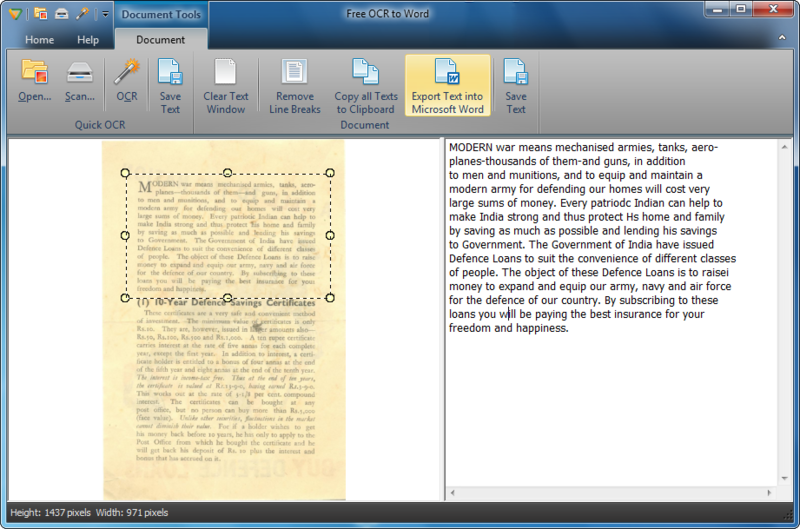 Free OCR to Word 6.0.2 Free Download - It creates editable and searchable MS Word or Text files from any images. Connected with multiple types of scanners, Free OCR to Word lets you scan paper documents and then convert scanned documents to MS Word documents readable &amp; editable by Microsoft office. Now you can turn all your paper documents into editable and searchable electronic documents and save them in the format of your choice. Free OCR to Word converts images to Word within just 3 steps easily: Open, Select and Convert. Simply open your images into our OCR to Word conversion window; select the text like the lines, paragraphs, or the whole image you want to extract and then click &quot;OCR&quot; button to instantly convert your image text into Word. Statement: First, please download the orginal installation package by clicking the download link. Of course you may also download it from the publisher's website. Using Free OCR to Word crack, key, patch, serial number, registration code, keygen is illegal. The download file hosted at publisher website. We do not provide any download link points to Rapidshare, Hotfile, Depositfiles, Mediafire, Filefactory, etc. or obtained from file sharing programs such as Limewire, Kazaa, Imesh, Ares, BearShare, BitTorrent, WinMX etc. Software piracy is theft. If you like Free OCR to Word please buy it.